We want to be just like Deadpool, but super powers just don't grow on trees. We've checked every pine tree north of Swan Lake (we're from Minnesota, so we relate all things according to lakes and mosquitoes) and none of them gave us super powers. We could have just given up and went home, but we're go-getters and we're not going to let a little thing like a lack of super powers stop us from dressing up like our favorite Marvel superhero and neither should you! 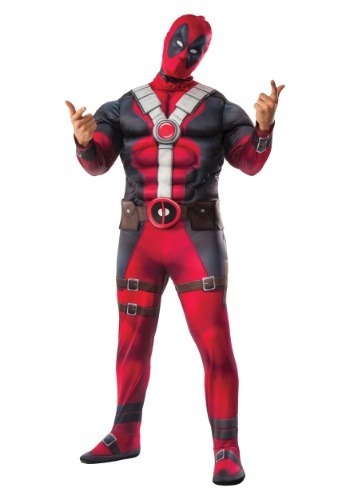 And we just happen to have this licensed Deadpool costume for you to wear! This Deadpool Movie Costume is a deluxe plus size outfit based on your favorite loud-mouthed mutant. The black and red costume has muscle designed right into the chest and arms of the jumpsuit, so you can get that muscly look seen in the comic books. The mask looks just like the one worn by old Wade Wilson, making it the perfect headgear for anyone who want to emulate the character. And the best part about this costume? You don't have to join any weird Weapon X program or get injected with Wolverine DNA or go through excruciating tests just to be like Deadpool. All you have to do is put it on and start coming up with one-liners.